In light of the coming provincial elections, we look forward to hearing your responses to the following questions. 1. 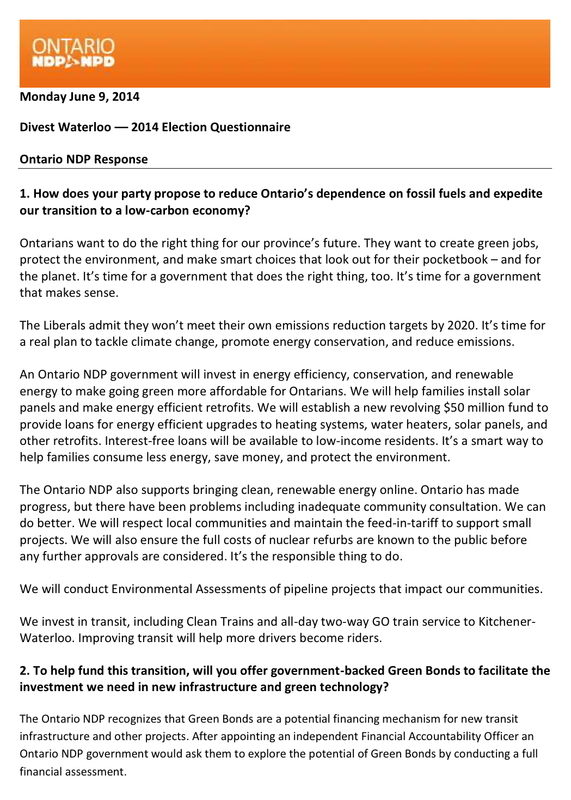 How does your party propose to reduce Ontario’s dependence on fossil fuels and expedite our transition to a low-carbon economy? 2. To help fund this transition, will you offer government-backed Green Bonds to facilitate the investment we need in new infrastructure and green technology? 82% of Ontarians support the concept of government-backed green bonds. (http://www.greenbonds.ca/pollresults.html). Please remember these numbers when you answer these questions. The Green Party has a strong plan to expedite our transition to a low-carbon economy. This issue underlies much of our platform. First, we intend to cancel the current 10% subsidy on electricity use that does nothing to lower energy use and benefits the greatest users most. Instead, we would like to create an energy efficiency plan that provides grants to homeowners, tenants and businesses to help pay for upgrades to save money and energy every month. Combined with green bonds and no to low-cost loans, we can offset a large portion of our use. We would cancel the expensive Darlington refurbishment that would lock us into higher energy use and instead import hydroelectricity from Quebec and provide tax-credits to businesses working on renewable energy sources. These tax credits encourage innovation, as well as providing jobs, improving local sources of energy and decrease our fossil-fuel use. We believe that large renewable installations should involve community partnerships so that they are supported and benefit local communities. We want to create dedicated revenue tools for paying for the vast public transportation needs that we have in this province; including a two-way, all-day GO service to KW and other municipalities. By using revenue tools such as congestion charges and parking levees, we can concurrently build revenues and grow use of our transit systems. Further, we want to take a portion of those levees for offsetting municipal transit costs to decrease user fees. Finally, we also want to provide 2% of our transportation budget to municipalities for walking and cycling infrastructure which will help increase our livable and walkable cities, which we will encourage further with updated policies. By putting more emphasis on buying local food and helping to create more local food processing, we can further decrease some of the fossil fuels creates by our food systems. Yes. In addition to tax credits for businesses engaging in our clean tech industry.